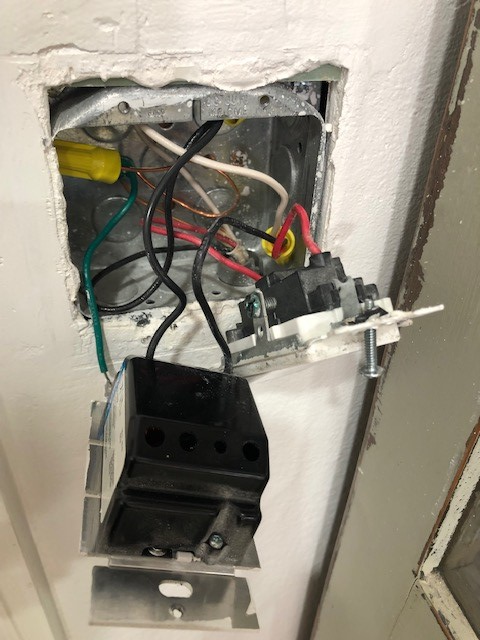 I am living in a condo and the owner has asked me to replace a switch from a dimmer to single pole to operate a ceiling fan. Upon inspection the ceiling fan has one 14/2 cable coming in with a black and white. The light switch as one 14/2 and one 14/3 coming in. There is a plug on the circuit that has one 14/2 wire coming into it. I am unable to determine where the 14/3 red wire goes. Its not in the ceiling box or the receptacle box. The light wasn't working when I took possession so I am totally stumped. The 2 white wires were coupled and the black wire when connected to the switch work the receptacle but the light (now a ceiling fan) doesn't work. Given not being able to find the other end of the cable, we can only guess on the probabilities. In this scenario, the /2 cable is power supply to the switch box, and the /3 cable goes onward to the fan to allow separate control of fan and light. There are also combination dimmers/fan speed controllers that can go in a 1-gang switch box; that would allow separate dimming of the fan and light. 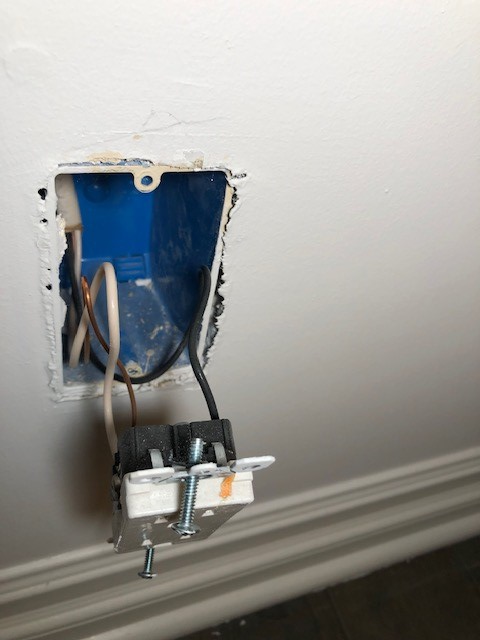 This is typically done by builders when they fit a fan-rated junction box in the ceiling. Absence of this /3 cable does raise a question of whether that junction box is actually fan-rated. A lamp-only box is simply too flimsy to cope with the dynamic (including wobble) forces from a fan, and the box will slowly tear out of the ceiling. 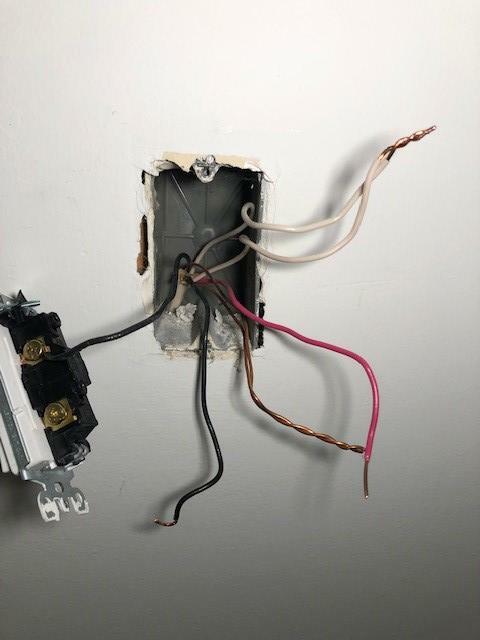 In this scenario, power (always-hot and neutral) comes from the /3 cable, which is sourced at a receptacle (whichever one the builder thought was the best choice for a lamp to be near) The extra wire (conventionally, red) is switched-hot, goes back to one of the receptacle sockets. It's intended for that socket to be switched by the switch. Separately from all this, the /2 cable goes up to the ceiling junction box. This arrangement allows you to either have both a plug-in and overhead light. Or if the ceiling box is fan-rated, to have 2-switch control of a plain fan-only in the ceiling and a lamp-only on the receptacle. However, there's a problem. You are not allowed to put dimmers on receptacles. * So if there was a dimmer here before, either there was an overhead light, or someone was naughty, or there is/was a weird receptacle somwehere in the room. Regardless, this possibility is your best hope. 3: /2 is supply/onward power. /3 is onward/supply and switched. In this scenario, the black and white in the /3 is supply always-hot and neutral, and the /2 is onward always-hot and neutral. Or possibly, the reverse, it doesn't really matter in this scenario. The red wire goes only to a split receptacle as described above (or rarely, a lamp, but then there would be /3 at the lamp). This case would imply that whoever ran the /2 to the ceiling box didn't bring it into this switch box at all. Either they are insane, or they brought it to the switched receptacle which you have yet to discover. They might go to the receptacle instead of the switch if it were easier to fish. Very often, American homes are built with no overhead light at all, only a switched receptacle and the homeowner is expected to plug in a floor lamp. This is a hokey arrangement**, so many homeowners retrofit an overhead light. Since it's a retrofit, they run the wires where easiest, which may be a receptacle. I believe the white wires are in fact neutral, so leave them connected. That leaves 3 hot wires: black/2, black/3 and red/3. So there are 3 tests possible, capping one and connecting the others. I would start by unhooking and capping all three and seeing what in the house loses power. It goes witout saying that any wire changes are done with breaker off. You will need to check every socket in every receptacle (i.e. Both of them) in the room, as well as some receptacles elsewhere. If any outlets outside this room lose power, that indicates scenario 3. If one socket in this room loses power, that strongly indicates that socket is the other end of the /3 cable. Next I would connect black/2 to red/3, capping black/3. I expect nothing will power up, but if anything does, that is of concern. If nothing powered up, and there was a dead socket in the room, I'd try connecting red and black from the /3 cable and capping black/2. If that socket powers up, that suggests scenario 2 or 3. Next I would splice the two blacks together, capping the red. See what regains power. If it's the lamp, that strongly suggests scenario 2. In scenario 2, you would get a double switch, black/3 to common, black/2 to one switch and red to the other. * Some appliances respond to dimming in a manner that could be called "fiery". If you really, really have your heart set on dimming a receptacle, they make very special sockets and plugs: the socket will only accept special plugs you put on your lamps. Those plugs also work in standard sockets. Not the answer you're looking for? Browse other questions tagged switch light bedroom or ask your own question. How to wire a light with multiple black/white/green wires from the ceiling? Black wire x3, white wire x3, ground wire x3.